Let's Go To Carburetor County! Description: Lightning and his convoy of Carburetor County friends rev up the party! 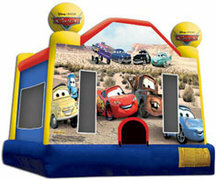 The memories of Lightning's journey to the Piston Cup and his unexpected detour in a small, unassuming town along the road called Radiator Springs are captured in KINDAS' Inflatable line. Brilliant graphics of Lightning, Flo, Doc, Mater and all the other big screen residents of Carburetor County provide a whole new life size experience for their fans!. They will come at the speed of "Lightning" to celebrate with you.